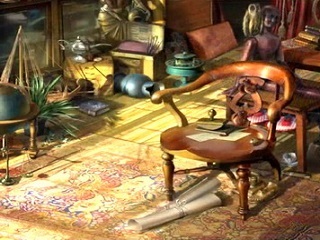 Antique Shop: Lost Gems London is a sequel to a previous game that took place in Egypt. This series is particularly different from many other match-3 games. Matching three or more tiles incorporates puzzles and requires a strategy. You can choose the mode you want to play the game in. It's either Casual or Limited where you only have a limited number of moves that you can make. One of the unique features of the game is its steam punk style that will appeal to the sci-fi fans. This game offers a continuation of a story about Emily that got trapped in a book. You are going to use your match 3 board to get the power over the evil that captivated Emily. It means that you are going to travel to different locations in London and play a level or two there to clear it from the evil force and weaken the powers of the book that holds Emily. You can choose the mode you want to play the game in. It's either Casual or Limited where you only have a limited number of moves that you can make. 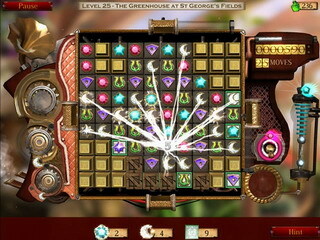 Each level has a goal, shown at the bottom of the screen. It is usually clearing all the silver tiles plus a number of other specific tiles. Just like many other games of this kind, it offers quite a few power ups. You can match 4 tiles and receive a bomb that needs to be matched with same colored tiles to go off. Matching 5 tiles gives you a pearl that removes all the tiles of a specific color when matched with them. Some tiles need to be unlocked (maybe even more than once) before they can be removed. As you proceed through the game, you get to earn quite a few power-ups that can be refilled. It is a fun and unique match 3 game. Explore the free trial version to see if it is your cup of tea! This is Antique Shop: Lost Gems London review. Download this game here.